Back in September 2009, I took a morning walk up Wilshire Blvd. My starting point was the intersection of Wilshire and Santa Monica Blvds, on the western edge of Beverly Hills - a couple of miles from UCLA (where I was working at the time). 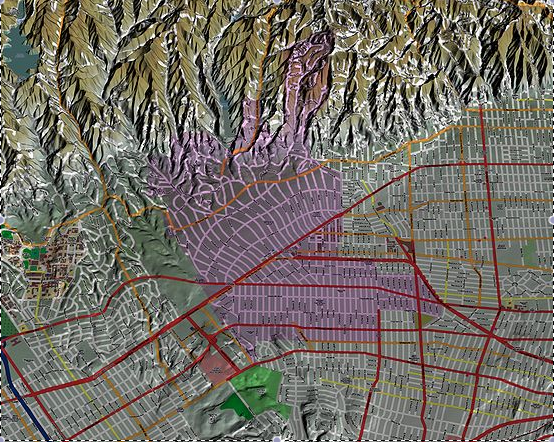 Beverly Hills, featured above in purple, is located in the heart of metro Los Angeles, half way between downtown Los Angeles and the Pacific Ocean. 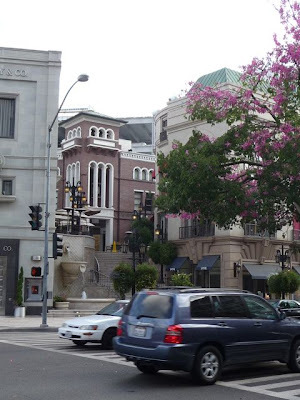 Unlike Bel Air or Hollywood (both of which are communities within the City of Los Angeles) Beverly Hills is independent city, surrounded almost completely by the City of Los Angeles. 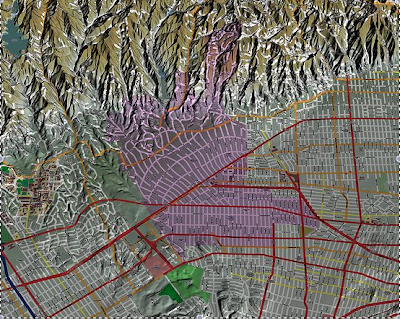 From the air, of course, it all blends together into one large (and sprawling) metropolis. The Beverly Hilton, which opened in 1953, at the corner of Wilshire and Santa Monica Blvds. 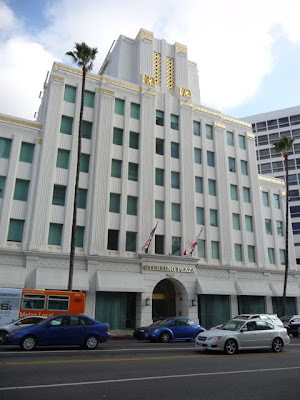 My High School Prom was held here back in 1979 (I didn't attend, long story). 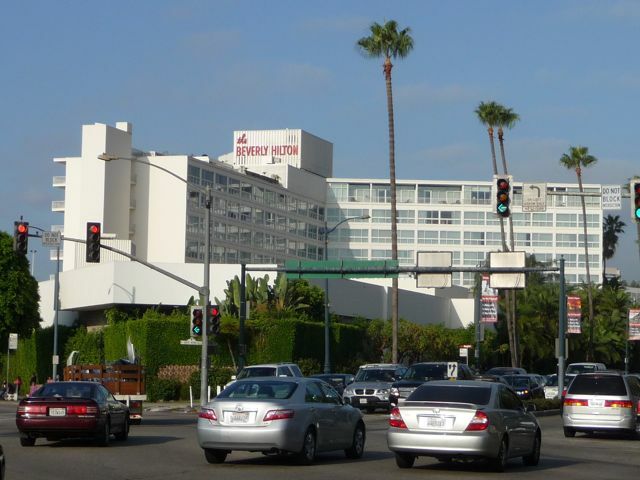 Plans are underway to renovate, upgrade, and enlarge the hotel. Which will, of course, increase traffic. Which, of course, means local residents are against it. 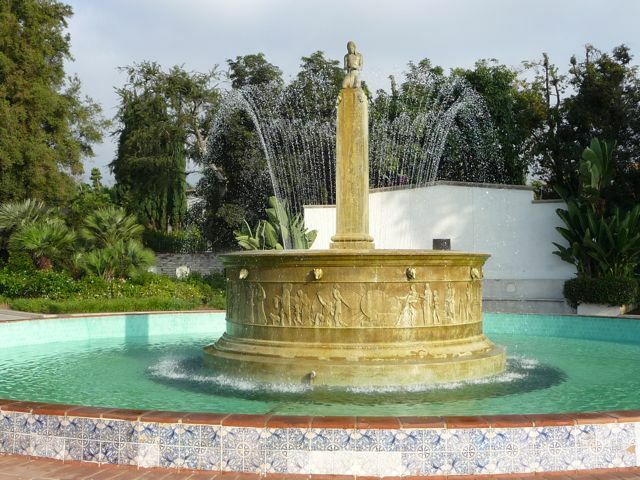 Also at this same intersection is the 1931 Electric Fountain - the name comes from the colorful electric lights that illuminate the fountain. Moms walking their kids to school. 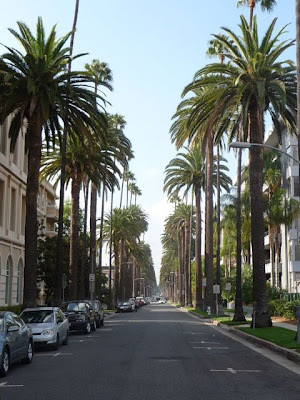 Yes, people do walk in Beverly Hills. 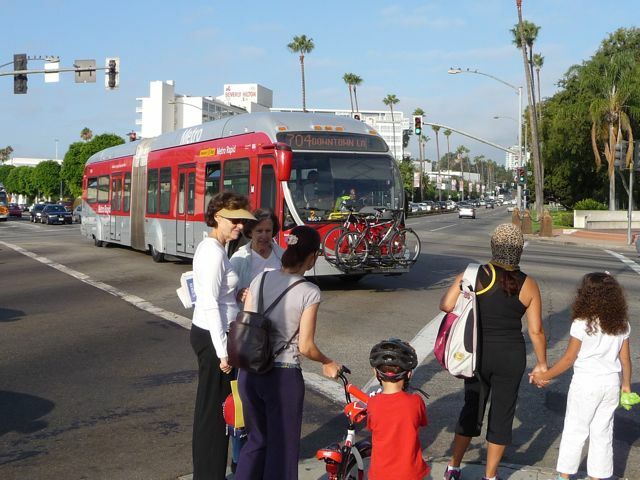 They also take the bus. Above the 704 Metro. 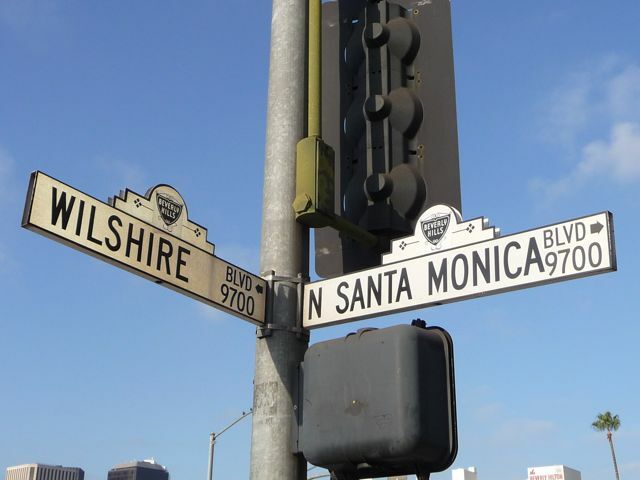 But mostly they drive. 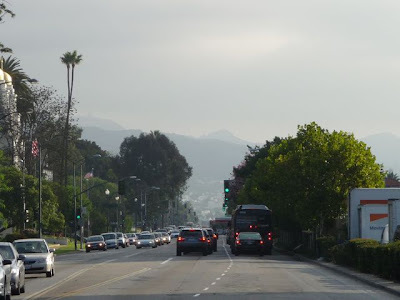 This is looking east up Santa Monica Blvd towards the City of West Hollywood, with the Hollywood Hills (the eastern Santa Monica Mountains) in the distance. 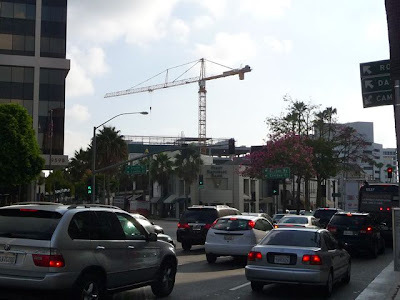 Looking east up Wilshire. 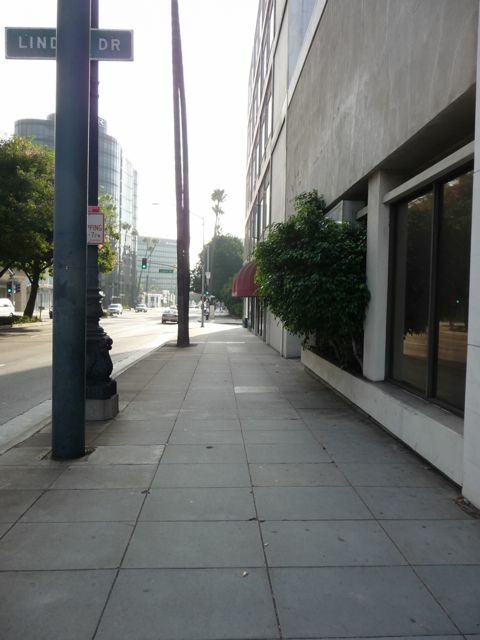 It was early - about 8am in the morning - but even at mid-day you won't see a lot a lot of pedestrian traffic compared to cities like New York, Chicago or San Francisco. 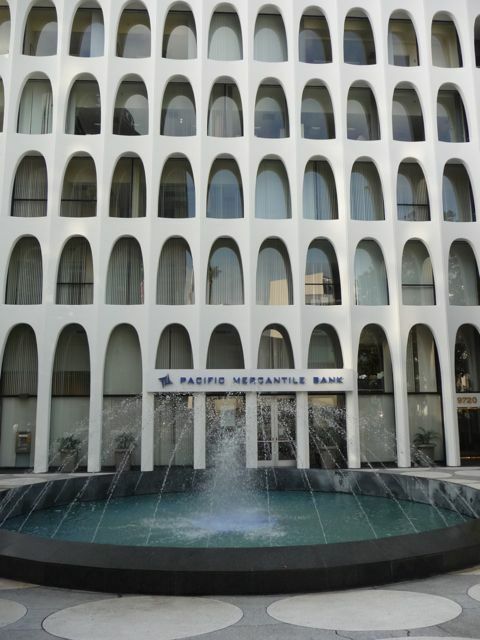 The Pacific Mercantile Bank building, corner of Wilshire and McCarty Drive. I love classic 1960's architecture. 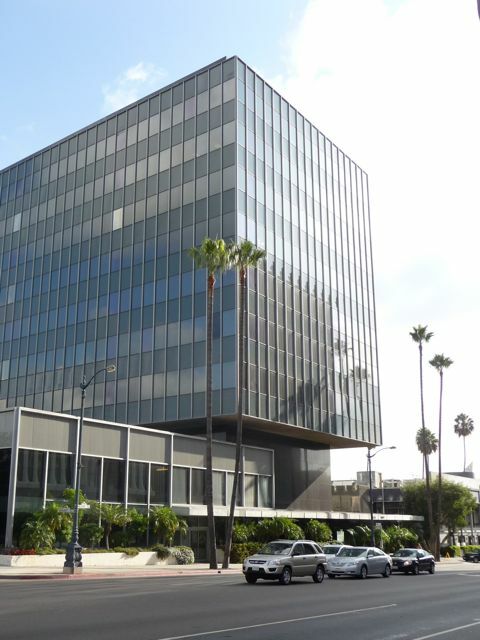 Looks like something out of the Disney-Pixar cartoon "The Incredibles." Neiman-Marcus: upscale shopping at the corner of Wilshire and Roxbury Drive. 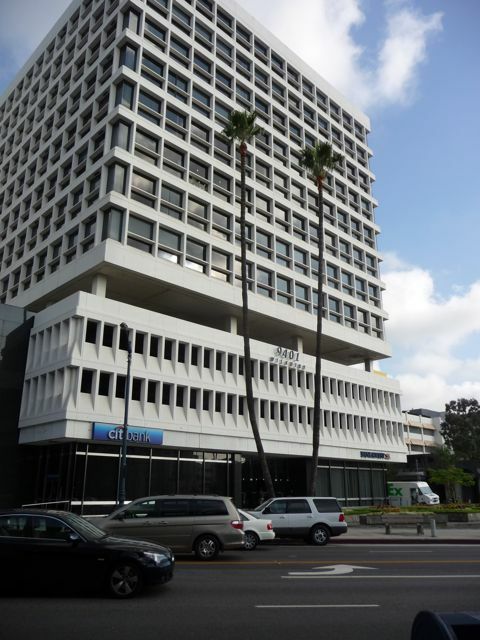 Citi-Smith Barney Building, corner of Wilshire and Bedford Drive. 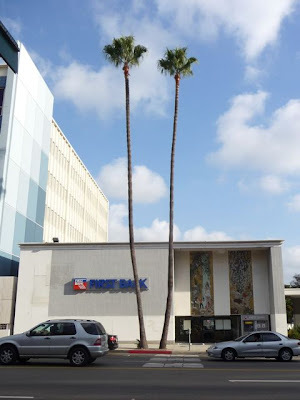 Really like the way the palm trees frame the corner of the building. The commercial and business district of Beverly Hills has a strict ten story height limit on all buildings, which is actually kind of nice. 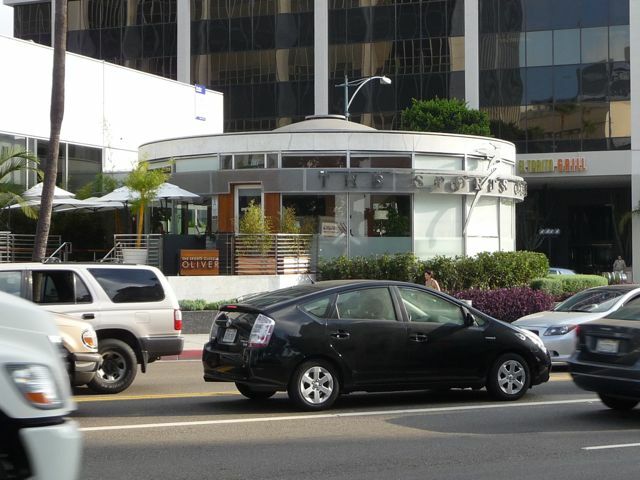 Oliver Cafe and Lounge, corner of Wilshire and Camden. This use to be a bank with the round building serving as the vault, completely surrounded by glass windows. Construction crane visible from the corner of Wilshire and Dayton Way. 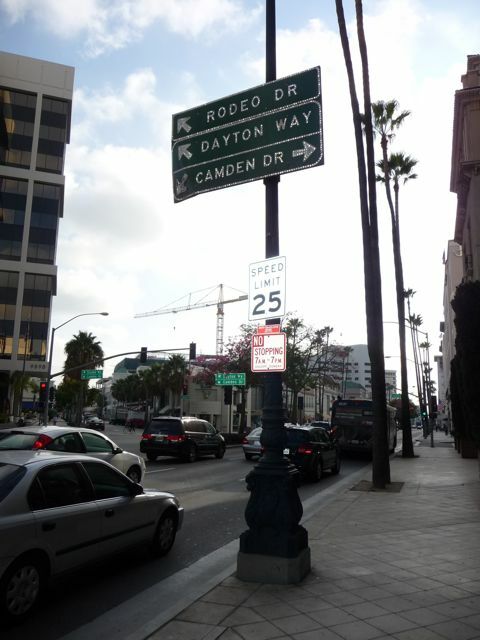 Rodeo Drive to the left. 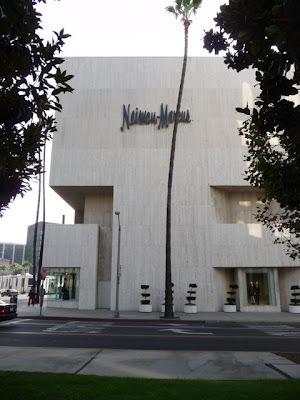 High-end stores that are neither my style, interest, or price range. Two Rodeo, on the corner of Wilshire and Rodeo Drive. 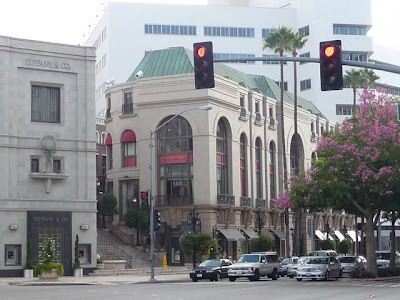 Beverly Hills' answer to a mini-mall. More 1960's style architecture: The Bank of America Building, corner of Wilshire and Beverly Drive. Across Beverly Drive is the Sterling Plaza Building. 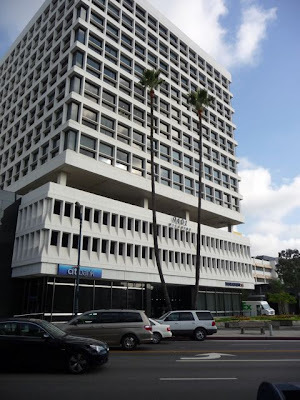 The CitiBank Building, corner of Wilshire and Canon Drive. 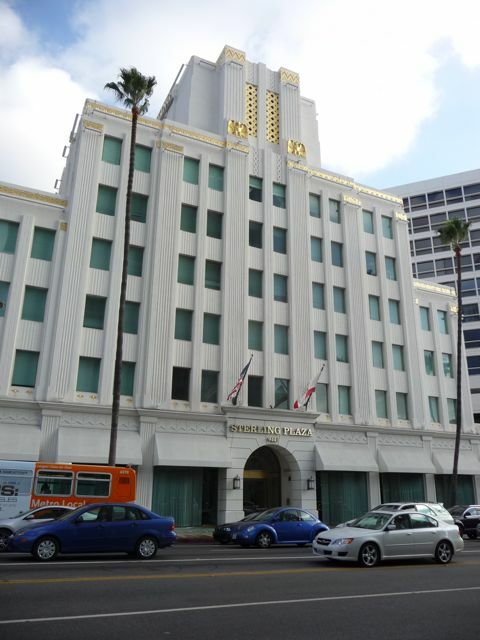 Same building, with a close up on the palm trees. A very small version of the 1969 murals found around Los Angeles. Apparently super graphics manufacturer Michael McNeilly has been pushing the envelope in terms of wrapping several Los Angeles area buildings with these same murals. The fear is, of course, that next step will be wrapping 12 story buildings in ads. 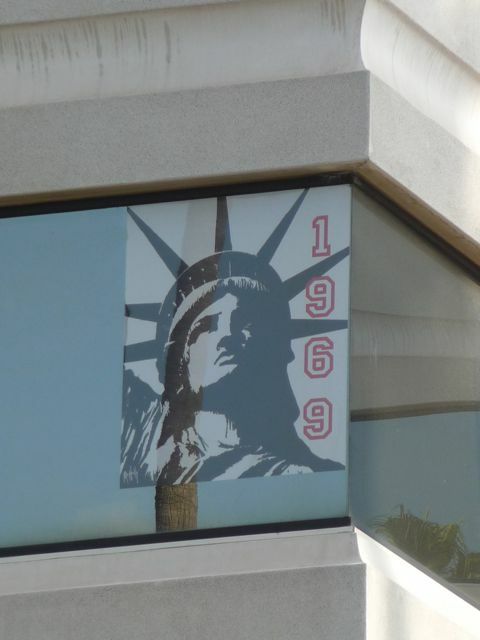 The small Statue of Liberty poster looks fine ... but few people want to see a city full of buildings wrapped in ads. 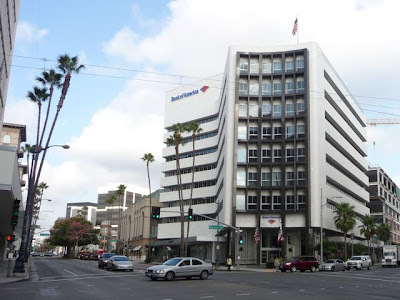 Home Savings, which became Great Western Savings, which became Washington Mutual, which became Chase Bank. 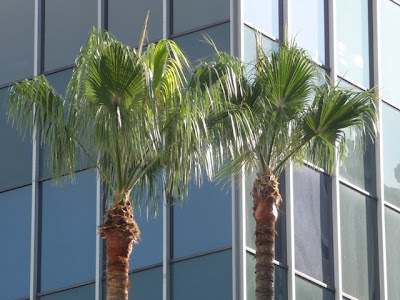 The white marble, gold wall designs, funky mural over the door, and obligatory palm trees all say B-E-V-E-R-L-Y H-I-L-L-S. 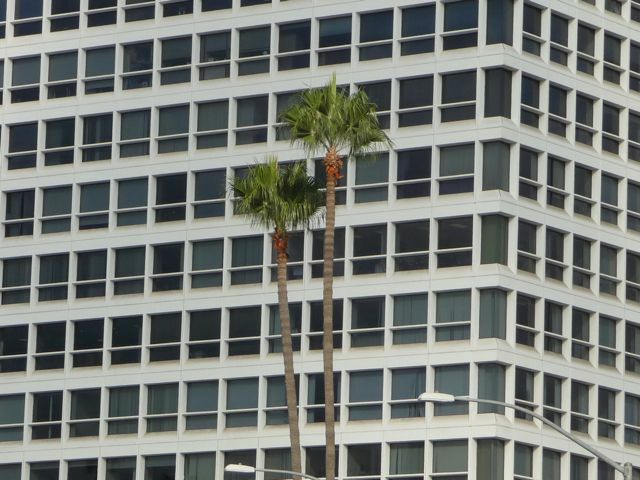 Looking south from the corner of Wilshire and aptly named "Palm Drive." 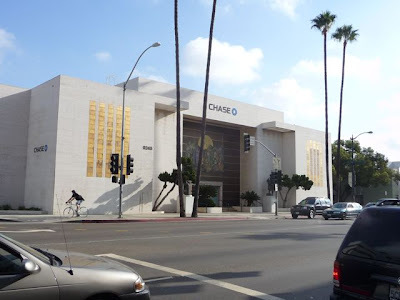 And this would be considered one of the "more affordable" areas in a city of incredible wealth. Yet another low rise bank building, more white marble, mural above the entrance, and palm trees. I think there's a pattern here. 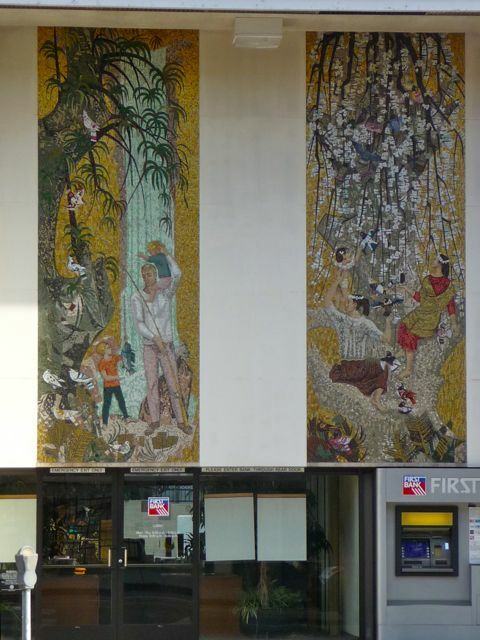 Here's a close up of the mural, in all it's 1960's grandure. 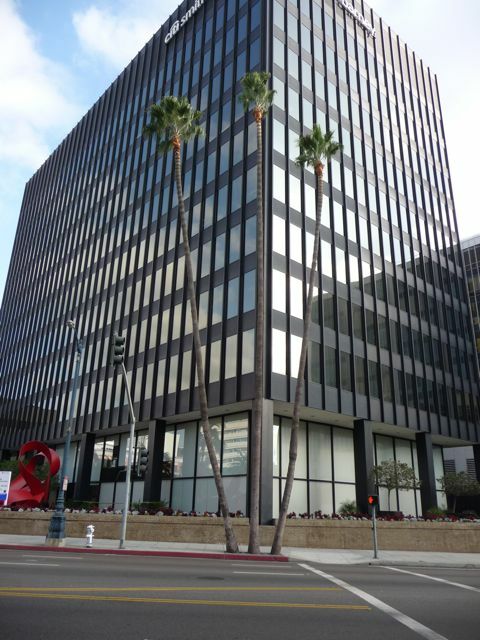 Office building, corner of Wilshire and Doheny. Heading east, this is one of the last "tall" (read: ten story) buildings along Wilshire. 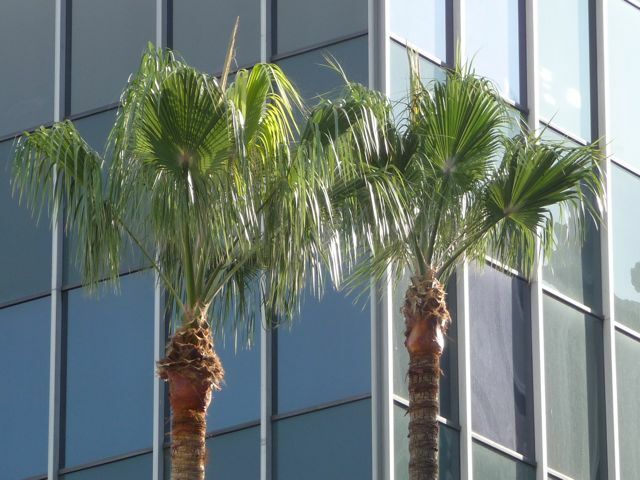 A final close up of the signature palm trees. 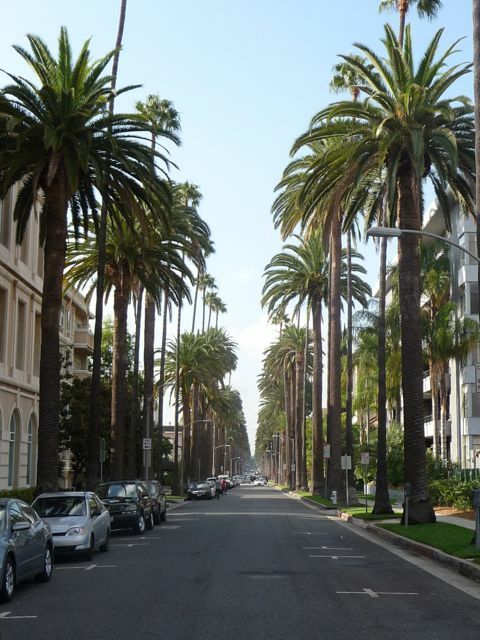 Beverly Hills is one of most affluent cities in the world, and with a medium home price of 2.2 million dollars, has the most expensive housing market in the United States. I'll save thoughts and commentary for a future post. 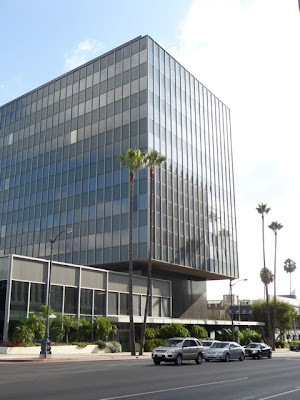 More on Wilshire Blvd in Part II next week.